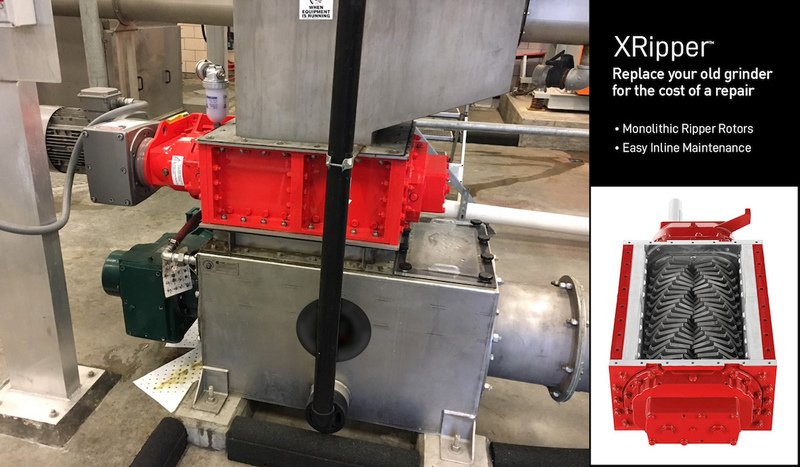 Wastewater treatment facilities have happily been replacing their old difficult-to-maintain twin-shaft grinders with Vogelsang’s XRipper grinder. And why not? Not only does XRipper’s one-piece cutting elements easily handle tough solids, they are easier to service and less costly to maintain than other units on the market. To make switching a no-brainer, Vogelsang offers new XRipper units at the cost of a repair — send Vogelsang your repair/replacement quote on your current unit and they will match the price. The Vogelsang replacement program has been popular for both in-pipe grinders and channel mounted grinders alike. However, Vogelsang is also replacing the horizontally mounted twin-shaft grinders that are commonly found in screenings washer-compactor systems. These systems, which are set up to shred and compact debris coming off screening systems, are designed to reduce inorganic debris into small particle sizes so it is more easily washed, compacted and loaded into trucks. The issues with current compactor systems are often tied to the idea that the grinder is difficult to work on, requires tedious repairs and/or expensive replacement programs, and service issues often result in significant downtime. When Vogelsang designed their twin-shaft grinder, engineers implemented the same design philosophy that makes their rotary lobe pumps so popular—robust construction paired with a service friendly, easy maintenance design. Read about Toronto’s Ashbridgers Bay WWTP deciding to switch to XRipper. Vogelsang provides wastewater operators with a grinder unit that doesn’t require shipping it back to the manufacturer for service or expensive cartridge replacement programs. Not only is XRipper a high-torque grinding machine, it is 100 percent serviceable in the field by your plant’s maintenance team. The one-piece cutting elements can be pulled without disconnecting the system and replaced without having to deal with individual blades and spacers. Review details or request info on how to get a new grinder for the cost of a repair.